But Sri Swamiji’s activities go far beyond the musical sphere. In India, He is revered as a great Yogi and Saint and has held numerous inspiring Yoga classes all over the world. In His Ashrama in Mysore, south India, He is known for cultivating the old Vedic traditions and His social activities are many. Charitable trusts, founded by Sri Swamiji are also supportd by the music productions. 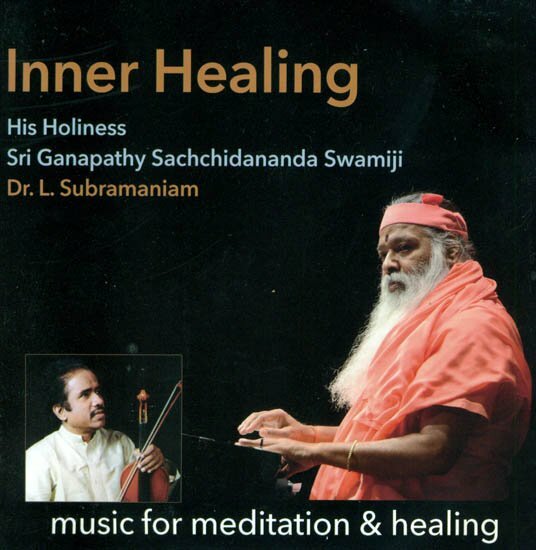 On this record, violin maestro of international repute, Dr. L. Subramaniam has ably supported Sri Swamiji, integrating the music and bringing out the unique and rich emotional content of the Ragas. The music is basically contemplative. Meditative and peaceful emotions emanate from it. This audio album brings you the result of Sri Swamiji’s first spontaneous recording session with Dr. L. Subramaniam that took palce in Santa Cruz, California, USA. The main tune, “Shantirastu” was composed by Sri Swamiji when He visited a riot-torn town in South India. It is still very popular because of its soul-strring, peaceful and harmonious melody. In the studio, it built an atmosphere that left everybody speechless for a long time after the recording, inclusing the musician themselves. You will hear the incomparable virtuosity of the musicians and at the same time feel the strong spiritual and healing energy that Sri Swamiji’s music is loaded with. This compact disc to brings you Music with a ehaling power – in concord with the ancient treatise, “Gandharva Veda”. Indian philosophers have long known that certain patterns of sounds can heal specific physical and emotional illnesses. In fact the science of Nadis (nerve passages), Chakras (nerve centres) and their subtle effect on the mind – body was intensely researched and fine – tuned by several great musicians over the centuries. For such music to be highly effective, the musician had to be a highly evolved spiritual master also. He had to first integrate his consciousness with the vast infinite super consciousness of the Divine and proceed from that exalted state in to his musical creation. Only then would every note to be charged with power to heal. Such a rare saint is His Holiness Sri Ganapati Sachchidananda Swamiji. He attained Siddhi (complete union with God) at age eleven, and since then has revived the lost “Raga Ragini Vidya” in to beautiful, powerful musical compositions in several languages. The healing effect of His music has already reached millions of people worldwide, both on his spiritually loaded recording and in many incomparable concerts. “But music will have no effect on you if you do not cultivate the art of listening” says Sri Swamiji. Indeed Indian tradition had researched the art of listening, too. “Nadopasana”, the Sanskrit term, means “Musical sound concentration”. In the ancient ages, in the tutor-Disciple method, the disciple was trained in the art of listening also, as it was recognised that not everyone could listen with total concentration for extended duration. “While listening, switch off the intellect. Quit analysing music and begin flowing in to it”, says Sri Swamiji. Indeed the intellect with its faculties of discrimination, reasoning and analysis presents the real hurdle to Nadopasana. This is because the intellect generates millions of tiny micro second thoughts that prevent the musical vibration from penetrating deep into our consciousness. However, “flowing in to the music” is easier said than done, and he reader would do well to start his practice of the “art of listening” along with this disc. One of the greatest things that happened to me was the opportunity I had to meet parama Pujya Sri Ganapati Sachchidananda in Switzerland in 1987. In recent years, I have had the good fortune and privilege to receive choicest blessings from Sri Swamiji, not only for myself, but also my entire family. We consider Sri Swamiji to be our spiritual guru. It is overwhelming that Sri Swamiji considers us to be a part of His family. His entrance into our life has made an incredible difference. One of the greatest honours I have received is “Asthana Vidvan” status in His Ashrama and being called “Nada Chakravati” (Emperor of Sound) by Sri Swamiji. When I had the privilege of performing for his 50th birthday celebrations in Trinidad, West Indies, He created a beautiful a beautiful chain out of a shiny thread from a rose garland He was wearing and blessed me with it. Later on, He materialised a beautiful Ganesha locket, which he “took out” from a flower that was part of a garland that was our humble offering to Him! The greatest of all pleasures has ben performing and recording with Sri Swamiji in India and in the United States. This CD “Inner Healing” (Music for meditation and healing) on which I had the pleasure of recording my midi-synthesiser with Sri Swamiji’s most spiritually powerful synthesiser has opened up new doors to a treasure of spiritual thoughts and inner peace. It is not possible to describe Sri Swamiji’s greatness and His Powers using any words that exist in the English language. One has to see, feel and believe. I hope that everybody gets his bliss and blessing of meeting this great Avatar! Jaya guru Datta!